He set down a long oval loaf of bread on the table, followed by a huge ceramic bowl filled with cut-up wedges of tomatoes, red potatoes, and hard-boiled eggs, coated with some kind of dressing. "This is ciabatta," he said, tapping the bread. I took a bite and was assaulted by savory flavors, muted by the hot, doughy bread. It was fantastic. Nina scooped potatoes, tomatoes and eggs onto a small plate for me. Her mother handed me a napkin. “Me!” Nina sang, popping a wedge of tomato in her mouth. “Sure,” I said, with a mouthful of gremolata and a heart plummeting into love. When I started dating Jeeps, he was living on the Upper East Side on the sixth floor of a sixth-floor walk-up. The kitchen was about two feet by four feet, but we did a lot of cooking in that tiny little space. Jeeps had one cookbook: Marion Cunningham's The Supper Book, which was perfect because the tiny kitchen didn't evoke big dinners, but it was perfect for supper. One of the recipes from the book we made a lot that first summer was Eggs, Tomatoes and Potatoes in Gremolata. It was summer and it was the city and I started capturing the little bits of our romance into stories because that's just the kind of person I was. Over the years, I began sewing the little stories into a larger story and it became a book called Bury My Heart in Cashmere, and the scene above is from it. Cashmere was never published. What became of it can be read in my fourth book The Ones That Got Away, but briefly: parts of Cashmere combined with an earlier manuscript called All The Running You Can Do, and became The Man I Love. The Supper Book makes a cameo in my next novel, An Exaltation of Larks, but with a different recipe. Enough promotion. Fast-forward to the present. Jeeps has a bad cold, and I'd been planning to make soup for dinner tonight to baby him. But the day started out muggy and got muggier by the hour. I got home from food shopping with soup makings and couldn't bear the thought of it. A much more summer-like meal was called for and for some reason, I felt like I wanted to make crab cakes. Crab meat had not been on the shopping list and I had no desire to go back out and get some. Tuna cakes could be an alternative but I wondered if could take the same premise and use roughy (which was on the shopping list). It's a mild fish, and I thought about using the flavors of gremolata—lemon, garlic and parsley—to jazz it up. Spray a skillet with non-stick spray and heat over medium. Saute the filets about 3 minutes per side until just opaque. Let cool and then chop roughly and place in a large bowl. 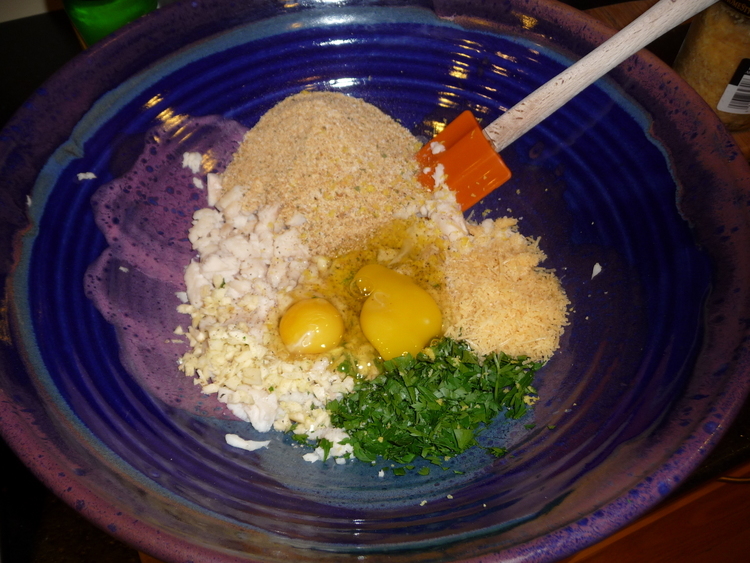 Combine with rest of ingredients and form into small patties. Fry in olive oil, 4-5 minutes per side until golden brown. Drain on paper towels. Serve with lemon wedges. These were awesome. Jeeps and I had them over arugula with focaccia and marinated mozzarella and cherry tomatoes. A perfect summer supper. Even for the invalid.